Like what you’re reading? Subscribe now and receive the full version of John Mauldin's Thoughts from the Frontline delivered to your inbox each week. Already have an account? Click here to log-in. We never share your email with third parties. 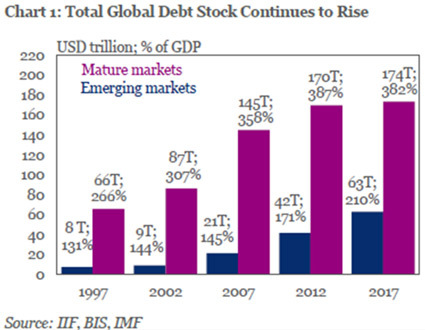 The developed world is far more leveraged than the EM world, but EM countries are no pikers at 210%. They often lack the stabilizing resources developed countries possess, too. 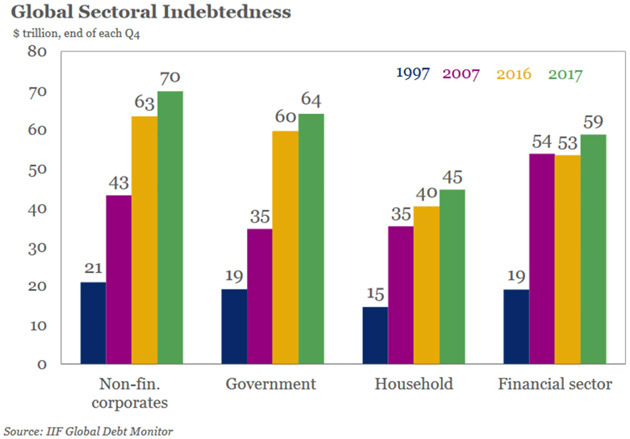 IIF points to Argentina, Nigeria, Turkey, and China for the largest debt ratio increases last year. 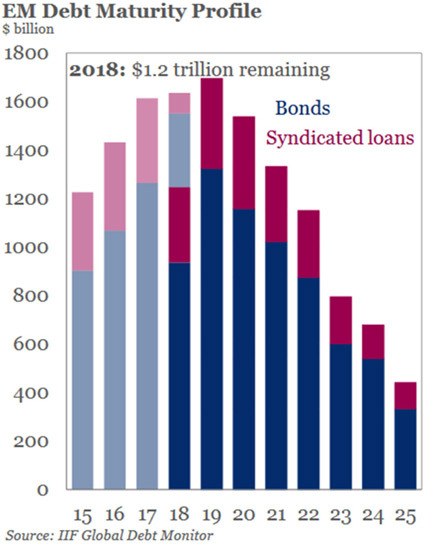 But many emerging market businesses and financial companies borrowed money in dollars, as the dollar was relatively weak and US interest rates ridiculously low. 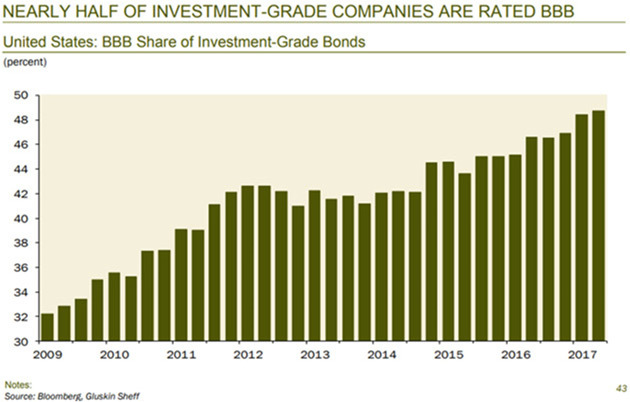 Further, our yield-hungry investors, both as individuals and its institutions, were more than willing to lend to them to get something more than 1–2% that they could from sovereign bonds. Did someone forward this letter to you? Click here to get Thoughts from the Frontline in your inbox every Saturday. June 21, 2018, 3:03 p.m.
With the dwindling number of workers being asked to support our social systems, including social security, the cost pressure is going to continue to intensify. As much of this job loss is related to the broader introduction of robotics, shouldn’t we look to those same robotics to contribute to the social budget? Perhaps through some sort of VAT? The idea has always been that the producing cover the costs of those who are past producing or in need. June 13, 2018, 8:48 a.m. I wanted to bring to Mr. Mauldin’s attention that he is being referenced in someone else’s article. Disagreement is normal and natural in the world. But that Advisoranalyst article, pulled from http://fat-pitch.blogspot.com/, lacks supporting evidence and seems to be mostly the writer’s opinion without much substantiation. For example the writer says, “Household interest coverage is as easy now as in the early 1980s and early 1990s, and it is stable, being unchanged from 1Q2013 (from JPM).” While that is technically true it is based on the LOWEST SUSTAINED INTEREST RATES IN HISTORY, a point that I did not see anywhere in the article. Anyone can create a blog and start talking about economics, markets and investing. But it doesn’t mean we should follow them. I worry about the people who read that person’s articles without the background to understand that he is presenting a very skewed perspective without giving credit to anything contrary. June 10, 2018, 9:55 a.m.
June 10, 2018, 7:21 a.m.
June 10, 2018, 6:35 a.m. 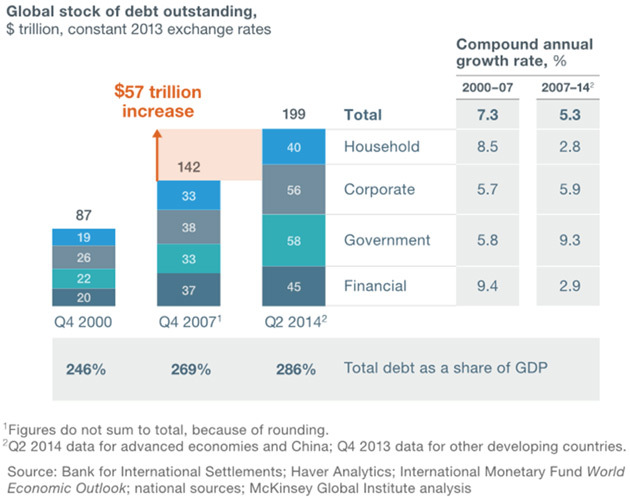 I quickly lost interest in the global numbers for government, corporate, and private debt. This is because I have to wonder about the accuracy of such numbers as the availability of such numbers varies greatly from country to country. Even many governments are opaque about their true debt levels. Even if we had perfect data from every country, the levels of debt in all three categories would still vary greatly between some countries. What would have been interesting is which countries are the highest and lowest in each category and which is best and worst overall. One last thought: If we couldn’t borrow money, the prices of everything would, of necessity, be much lower. Imagine what house prices would be if you had to pay everything up front. The same goes for cars as 7-year loans are not unusual anymore. Also, college prices were very stable when students had to pay as they go. Once the federal government jumped in and goosed demand by handing out loans and grants, the rest is history. Ironically, the government claims it is distraught about high student loan rates. Thoughts from the Frontline is a free weekly economic e-letter by best-selling author and renowned financial expert, John Mauldin. You can learn more and get your free subscription by visiting www.MauldinEconomics.com. Any full reproduction of Thoughts from the Frontline is prohibited without express written permission. If you would like to quote brief portions only, please reference www.MauldinEconomics.com, keep all links within the portion being used fully active and intact, and include a link to www.mauldineconomics.com/important-disclosures. You can contact affiliates@mauldineconomics.com for more information about our content use policy. Thoughts From the Frontline and MauldinEconomics.com is not an offering for any investment. It represents only the opinions of John Mauldin and those that he interviews. Any views expressed are provided for information purposes only and should not be construed in any way as an offer, an endorsement, or inducement to invest and is not in any way a testimony of, or associated with, Mauldin's other firms. John Mauldin is the Chairman of Mauldin Economics, LLC. He also is the registered Principle of Mauldin Securities, LLC, a FINRA and SIPC, registered broker-dealer. Mauldin Securities LLC is registered with the NFA/CFTC, as an Introducing Broker (IB) and Commodity Trading Advisor (CTA). John Mauldin, Chief Economist and Investment Advisor Representative, CMG Capital Management Group, LLC, provides investment management services through its affiliated mutual fund, the CMG Mauldin Solutions Core Fund (the “Fund”), a series of Northern Lights Fund Trust, an investment company registered under the Investment Company Act of 1940. CMG receives a management fee as the investment manager to the Fund a portion of which is paid to John Mauldin.. A complete description of the Fund, its strategy, objectives, and costs is set forth in the Fund prospectus, a copy of which is provided to all clients that engage the Registrant’s services through the Fund. This message may contain information that is confidential or privileged and is intended only for the individual or entity named above and does not constitute an offer for or advice about any alternative investment product. Such advice can only be made when accompanied by a prospectus or similar offering document. Past performance is not indicative of future performance. Please make sure to review important disclosures at the end of each article. Mauldin companies may have a marketing relationship with products and services mentioned in this letter for a fee. PAST RESULTS ARE NOT INDICATIVE OF FUTURE RESULTS. THERE IS RISK OF LOSS AS WELL AS THE OPPORTUNITY FOR GAIN WHEN INVESTING IN MANAGED FUNDS. WHEN CONSIDERING ALTERNATIVE INVESTMENTS, INCLUDING HEDGE FUNDS, YOU SHOULD CONSIDER VARIOUS RISKS INCLUDING THE FACT THAT SOME PRODUCTS: OFTEN ENGAGE IN LEVERAGING AND OTHER SPECULATIVE INVESTMENT PRACTICES THAT MAY INCREASE THE RISK OF INVESTMENT LOSS, CAN BE ILLIQUID, ARE NOT REQUIRED TO PROVIDE PERIODIC PRICING OR VALUATION INFORMATION TO INVESTORS, MAY INVOLVE COMPLEX TAX STRUCTURES AND DELAYS IN DISTRIBUTING IMPORTANT TAX INFORMATION, ARE NOT SUBJECT TO THE SAME REGULATORY REQUIREMENTS AS MUTUAL FUNDS, OFTEN CHARGE HIGH FEES, AND IN MANY CASES THE UNDERLYING INVESTMENTS ARE NOT TRANSPARENT AND ARE KNOWN ONLY TO THE INVESTMENT MANAGER. Alternative investment performance can be volatile. An investor could lose all or a substantial amount of his or her investment. Often, alternative investment fund and account managers have total trading authority over their funds or accounts; the use of a single advisor applying generally similar trading programs could mean lack of diversification and, consequently, higher risk. There is often no secondary market for an investor's interest in alternative investments, and none is expected to develop. You are advised to discuss with your financial advisers your investment options and whether any investment is suitable for your specific needs prior to making any investments. Invalid email. Please enter valid email address.